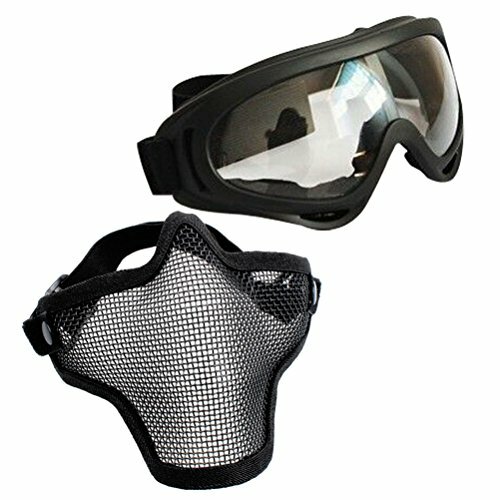 Made of premium material, the half face mask and googles set is durable and long lasting use. Equipped with elastic strap, you can adjust it for better fit. The airsoft mask can be gently bent to fit to your face better. Superb air ventilation prevents fogging from the mesh part. Inclusive tactical goggles can prevent wind and dust from your eye without disturbing your vision. Perfect for airsoft, hunting, paintball, shooting and any other outdoor activities. - Material: PC and iron. - Size of half face mask: About 19 x 16 x 12cm/7.5 x 6.3 x 4.7inch. - Size of googles: About 18 x 8 x 6cm/7.1 x 3.1 x 2.4inch. - One size fits all. The skull design is very cool. With adjustable elastic strap for better fit. - Soft wearing. Cheek position adopts thickened skull mesh, more closer to the face design. - Lightweight and foldable design. The airsoft mask can be gently bent to fit to your face better. Superb air ventilation prevents fogging from the mesh part. - Windproof and dustproof. Inclusive tactical goggles can prevent wind and dust from your eye without disturbing your vision. - Wide application. The PC ballistic lens can provide enough protection to BBs. Perfect for airsoft, hunting, paintball, shooting and any other outdoor activities. One size fits all. The skull design is very cool. With adjustable elastic strap for better fit. Soft wearing. Cheek position adopts thickened skull mesh, more closer to the face design. Lightweight and foldable design. The airsoft mask can be gently bent to fit to your face better. Superb air ventilation prevents fogging from the mesh part. Windproof and dustproof. Inclusive tactical goggles can prevent wind and dust from your eye without disturbing your vision. Wide application. The PC ballistic lens can provide enough protection to BBs. Perfect for airsoft, hunting, paintball, shooting and any other outdoor activities.